As you move toward a paperless environment, it is essential to plan how you will be converting your paper documents to electronic format, the first essential step in creating a functional digital archive. In other words, you need to start by choosing the right scanner for your organization. Scanning of your corporate documents should be as time and cost efficient as possible and produce high-quality digital replicas of your paper files. After all, you want to get rid of paper and make the transition as smooth as possible for your staff. The main goal is to feel confident that you can use the digitized documents the same way you use paper documents without compromising quality. If you choose your scanner incorrectly or use it for scanning jobs that it was not designed to do, you run the risk of incurring unnecessary costs. If you have a large volume of documents that need to be processed quickly, you may require a central scanning station, such as a file processing room in a multiple-office environment. Alternatively, you may only need to have a scanner placed in one or more departments or on individual user desktops. Your needs will determine the size, type and speed of the scanner that you will use. Scanner speed is proportional to its cost. The more pages per minute (ppm) the scanner can process, the more it will cost. It is therefore important to estimate how many pages you will be scanning per day and how quickly you wish them to be scanned. 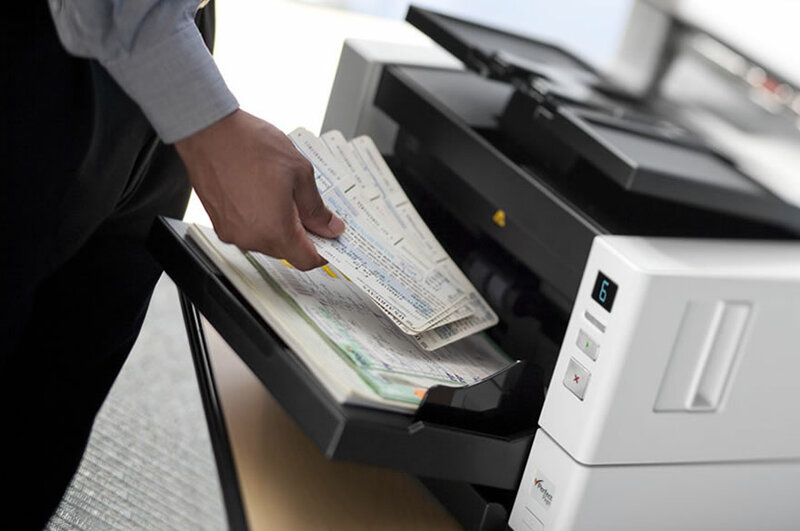 There are a number of reputable companies that offer a wide range of high-quality scanners to meet the needs of demanding customers worldwide, including: Kodak, Fujitsu, Canon. Desktop scanners easily fit on an office worker’s desktop and can typically scan 20-30 pages per minute. Desktop scanners are not the same type of scanners that you would use at home, for example, to scan a few document pages. Departmental scanners are designed to scan a few thousand pages per day and are usually set up as dedicated scanning stations for one or more departments. These are not multi-functional printers that you would normally find in a typical office. Production scanners are used in high-volume, high-speed centralized scanning environments (e.g. daily processing of huge volumes of insurance claims, invoices, incoming mail, etc.). Network scanners are used to scan documents directly to the network without having to use a PC. Document size and type need to be matched to your scanner’s capabilities. For example, are your documents standard size or their sizes differ? Are they single- or double-sided, black and white or coloured? Do your documents have handwriting, notes, highlights on them? Do they contain images? Will you be scanning paper documents only or also forms, carbon copy, cards, etc.? Image quality is an essential consideration. If you are not able to read the documents you have scanned and use them in your day-to-day operations, scanning serves no purpose. Scanned documents should reproduce their original paper versions. Scanners offer many image processing functions and enhancement capabilities: colour correction, pencil/ink marks, dark and light text, etc. Once your documents are scanned, you have to be able to view them, work with them and integrate them into your daily workflows. You will need document management / document archiving software, such as iGuana iDM, that is specifically designed to capture, distribute, manage, archive and help you easily retrieve your scanned documents. It should also be able to integrate them into your other IT systems (CRM, HRM, ERP, etc.). Your document management software provider should be able to advise you on how to chose the right scanner for your needs. This is exactly the type of service that iGuana offers to its clients: we analyze our clients’ scanning and archiving needs, then provide them with scanners as part of our total solution package. Like any other hardware, your scanner(s) will require regular maintenance as well as parts replacement due to normal wear and tear, and so forth. We therefore advise that you carefully consider what is offered as part of your scanner’s maintenance agreement and warranty. At iGuana, we have technical staff that are dedicated to and are responsible for installation, maintenance and repair of scanners supplied as part of our solution package, allowing us to serve as one point of contact for customers for all their scanning and archiving needs.